Lawai International Center is very interesting place. The more often I go to the center, the more I want to go there. 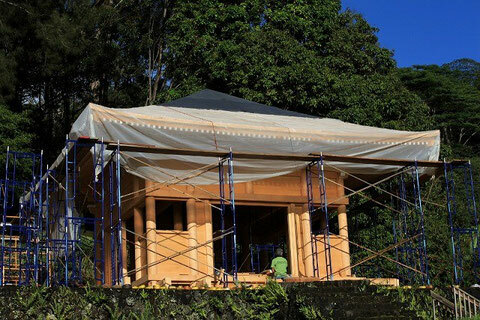 Especially, they are now building a replica of 13th century temple structure, there is always "something" I can see. Interestingly, this temple will not have any Buddha Image or religious icon after the completion of the temple. There seems to have the altar place for the image, but no statue will be placed. Recently I received an interview about the center by the Garden Island Paper writer. I commented, "Temple is supposed to be for its sacred religious image, but there will be no images here. This is like "Heart Sutra." Form is emptiness and emptiness is form. Because there is no image here, each one can find its own Buddha image. Maybe, someone will find Jesus here." This building was named "Hall of Compassion", according to Mrs. Lynn Muramoto. I have seen workers working hard together. 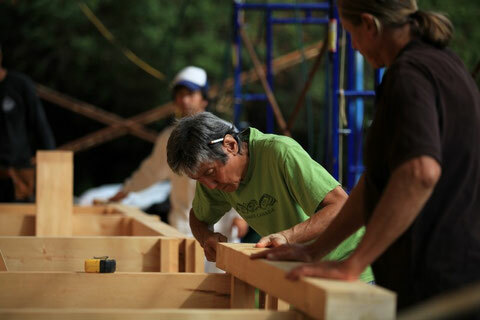 There were Taiwanese carpenters, a Japanese carpenter, and many local volunteers who originally came from various places in the world. Their races, cultures, religions, faiths are different, but got all together here. Now I recall a saying by a Japanese legendary artisan master T. Nishioka who renovated Horyuji Temple which was originally built in 607, the oldest wooden structure in the world. each of wood has its own attributes or characteristic. Joining different attributes of wood is like joining people together. I see peace, harmony, and dedication at Lawai. I believe you can easily see them there at the construction. In many more years later, many people who dedicated themselves to the Hall of Compassion will be forgotten. But their love, compassion, and peace will remain with the Hall of Compassion. For visitaion or volunteering, please email to LM@hawaii.rr.com or call (808)639-4300. I'm sure their president Mrs. Lynn Muramoto and volunteers will give you their warmest Aloha. Also if you are interested in coming to Koloa Jodo Mission, please let me know!!! I almost forgot it but our temple building roof needs to be fixed. When it rains, it leaks. I will definetely appreciate your contributions! I also appreciate your help if you could fix my writting in English. Let me know. I would be happy to work on the roof. I'm also happy to help with proof reading your English, though I think you should trust your command of the language. Mark Twain knew there's more than one spelling for any and every word.